Remember when I made that Star Wars Lego cake and I said that I would make each of the Abel kids a cake by their tenth birthday? Well, we blew that rule right out of the water. This is Aly’s birthday cake. 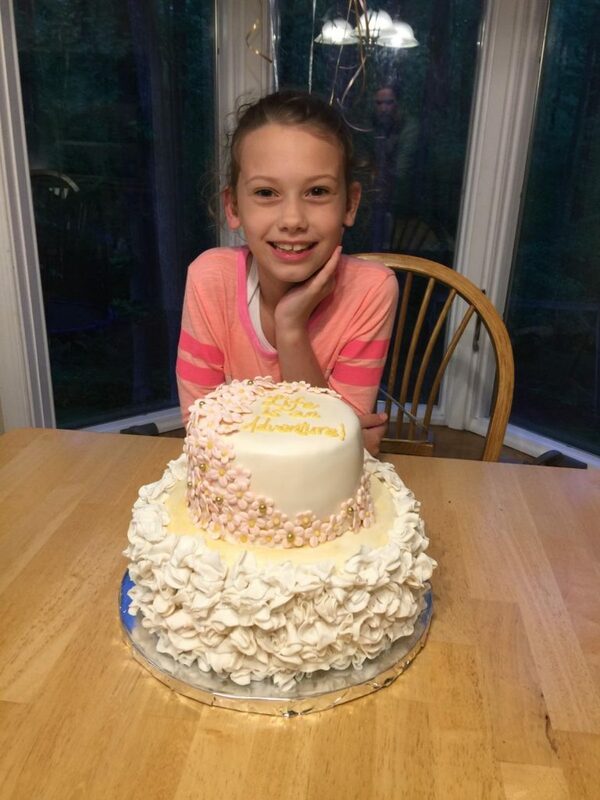 Her eleventh birthday cake. Whoops. Turns out last year she was out of town for her tenth birthday, so I gave her a one year extension. When I asked what kind of cake she wanted, she said, “A three tiered wedding cake that’s pink and gold with flowers”. Ok, I like your thinking Aly. Reach for the stars. Since she was only having five friends over for her birthday, we talked her down from a three tiered cake, to this two tiered cake that merely serves thirty. Given my general instructions for design, I decided I would go simple. No, this isn’t my version of simple. My version of simple is underneath all those ruffles and looks bad when I try to rush a cake. 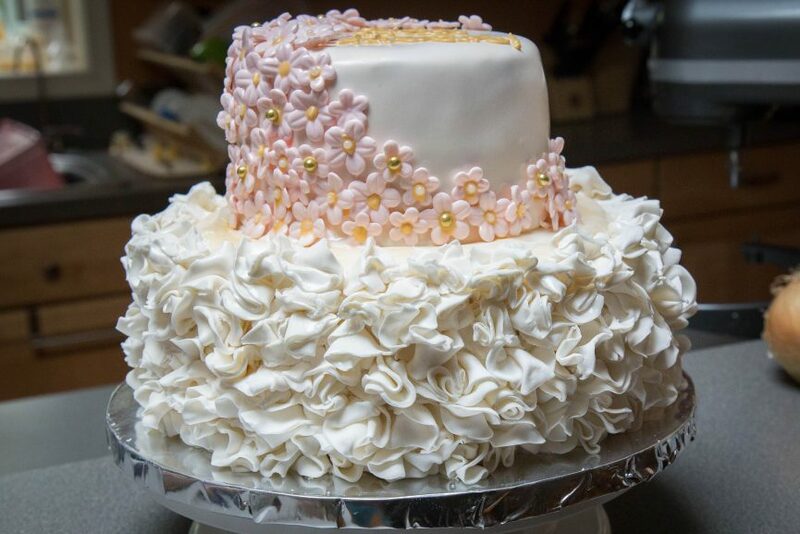 I’m not sure what happened, but the bottom tier of this cake started to look less than beautiful, so I decided to add these ruffles to make the sophisticated cake Aly was looking for. Each ruffle is made out of a circle of fondant that is thinned at the edges. Then the circle is folded in half and then folded again to make a ruffle. Then each ruffle is pressed onto the cake, and with some careful arranging, I think there’s a pretty nice effect. I’m not gonna lie, this took a while. It wasn’t hard, just tedious (my favorite kind of task!). I even had a rare assist by Andrew who helped cut out some of the ruffles. It was all worth it when I dropped it off for Aly’s party and got an open-mouth gape and a big thanks!